Cookery Book Supper Club: The Knives are Out! Bought Borrowed Stolen is a big book full of big, bold and tasty recipes. 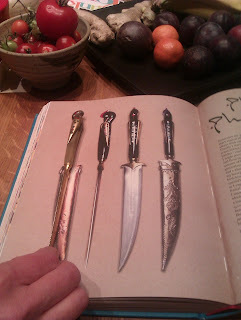 It uses a very novel technique for guiding the reader through the different regions and recipes, that of the author's penchant for collecting kitchen knives on her travels. This was great fun and much like Allegra, we too find it essential to round off a holiday with a visit to a supermarket or homeware store to pick up a useful kitchen item. Much discussion ensued on this point, culminating in a show and tell style knife off! With Rose bringing an identical knife to one in the book (see photo) and Angie throwing (not literally) a fine Thai fruit carving knife into the mix. Once all the knife discussion was over we dined on Pumpkin Stew which looked bright and colourful and just felt right for the end of October being both comforting and spicy. We followed this with a chicken, rice and peanut dish with an unpronounceable name. Equally tasty and with lots of textures. It's a really simple dish to put together for supper and can also be made successfully with leftover chicken. We rounded off our culinary tour in the USA with the West Coast Ricotta Cake, lovely and lemony and Oaty Pancakes served with maple syrup. It's a nice book to pick up and read, although we didn't feel it needed the fact files on each country. The photography is a little uninspiring throughout and you'll need to get to grips with the lingo "chuck the corry in", but aside from this, there is much to inspire. Other recipes tried were Apple and Chicory Slaw, Pork Adobo and Green Juice. 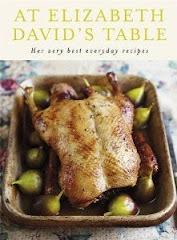 The book is very similar in concept to Orchards In the Oasis by Josceline Dimbleby, the travelogue cookbook is flavour of the month it seems.